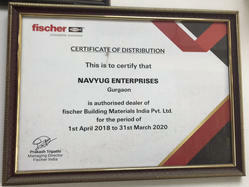 Established in the year 2008, it has been eight years since we, Navyug Enterprises, have been in the industry, engaged as a Wholesaler and Distributor of a wide range of Power Tools like Cordless Jigsaw, Drywall Screwdriver, Bonded and Coated Abrasives, Pneumatic Products, Hardware & Mill Stores, and more. 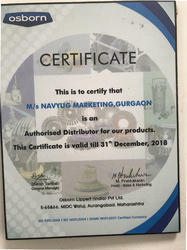 We are an authorized distributor and dealer of reputed brands such as Pidilite, Norton Saint Gobain, McCoy Soudal, etc. 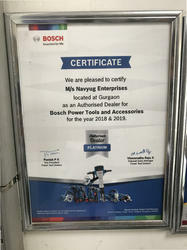 Bosch Powertools, Janatics Pneumatic, Deerfos Abrasives, Mccoy Soudal, Fischer Fixing Systems, All types of Tapes, Pidilite Adhesives, Polygel Adhesives that are widely used across various industry verticals. Under one roof, we provide a wide range of industrial products such as Drill Machine, Blowers, Battery Operated Tools, Polishing Wheels, Water Proof Emery Paper, Air Cylinders, Hydraulic Fittings and Pipes, Hex Bolts, Nuts, Rivets, Tubes, Air and Gas Pipes, and more. With the support of our Proprietor “Mr. Manoj Bihani” we have been able to gain the confidence of our clients. Some of our renowned clients are Suzuki Motorcycle Ltd., Honda Scooter and Motorcycle Ltd., Maruti Suzuki India Pvt. Ltd., Hero Honda Ltd., etc. Our success in this industry is the outcome of the meticulous efforts put in by our team of skilled professionals. These professionals are carefully selected on the basis of their skills and domain expertise. Our professionals work in close coordination with each other to achieve the organizational goals. Moreover, owing to the hard work and dedication of our team members, we are able to deliver a quality range of coil nailer machines and packaging material, well in time. Due to the help of our capable procuring agents, we are able to provide our clients with a remarkable and reliable collection of products in several specifications within the limited time period. We are one of the prominent manufacturers, suppliers, and exporters of coil nailer machines and packaging material. Our range of these products is superior in quality and caters to the requirements of many industries. Being a client-centric company, we lay utmost emphasis on meeting the diverse requirements of our clients. Our range of coil nailer machines and packaging material is manufactured using quality material and is offered at competitive prices. These products can also be customized as per the specific requirement of our clients. Apart from offering quality products, we also provide efficient after sales services. 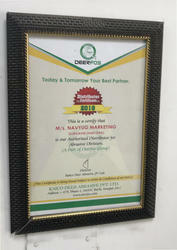 Owing to the superior quality of products and customized range, we have earned immense appreciation and acquired many reputed clients. Honda Scooter and Motorcycle Ltd.